As I wrote a couple of days back, I downloaded the PDFs of both the Auerbach and Albeck Eshkols and perused them. After writing my original posting on the subject of the Nahal Eshkol, I emailed Prof. Marc B. Shapiro (who is the person who seems to have written the most about this subject online) with several outstanding questions I had on the subject. His reply was that the answers to my questions about the source of Albeck’s manuscript could be found by reading the introduction to Albeck’s volume. I was also interested to see what Auerbach had to say about his volume, so full of expectation I set about reading both volumes. The first thing that I noticed is that they are entirely different books. I am no scholar, but without having read them from cover to cover, I would hazard a guess that they have no common sections in them at all. I then went on to read the editors’ introductions. Auerbach’s introduction is written in long and ornate language and starts off with the story of how he duscovered the manuscript beautifully written “in well formed Sefardic hand” and amazingly erudite etc. and how he came to the conclusion that he had the Eshkol in his hands when he found sections that had been quoted by other books as being from the Eshkol. He then continues that the manuscript was in a very bad condition and that he needed to do a lot of work to interpret it and bring it to print. He claims that the manuscript was rotten and infested and in addition that there were sections written in another hand that he claims were fake. It came as quite a shock when in 1909, many years after Auerbach had died, the great scholar R. Shalom Albeck accused him of having invented the story of the Spanish manuscript in order to enable him to forge the work. Needless to say, the supposed Spanish manuscript has never been found. In the following chapter I will enumerate the names of the authors who attributaed the Sefer HaEshkol to “Rabenu Ha-Abad” (R. Yitzhak of Navorna) and the writers who used the work. Here my purpose is to show the quality of the two manuscripts of this book from which I copied the book that present before you. 1) This I will call the “Carmoly manuscript”, for it comes from the library of the honored Eliakim Carmoly of Frankfurt Am Main. This is the manuscript that was used by Rabbi Auerbach in the Eshkol that he printed and it is now in the possession of the inheritors of his estate in Halberstadt. It is written on strong paper of quarter size in old, wide and well formed Sefardic script. The manuscript starts on page 2, and by counting it can be seen that not only page 1 is missing, and before it is a smooth sheet like a title page on which has been written in large lettering [by Carmoli?] “Sefer HaEshkol of Rabenu Avraham son of Rabbi Yitzhak of Navorna. He then goes on to describe a second manuscript “the Paris manuscript” that he used to supplement the Carmoly one where it was missing pages or was difficult to read. You will probably have noticed an amazing revelation here. Albeck worked from a manuscript that he got from the Auerbach family in Halberstadt! So was this presumably the manuscript that Auerbach used? If so, then how did Albeck claim that the whole Spanish manuscript story was a fake and how does Shapiro say that Auerbach’s manuscript was never found? It certainly appears that Auerbach had a manuscript, even if he faked the text rather than laboring over the original. Albeck’s description (on the page subsequent to the quote above) of the manuscript is that it was in a much better state than Auerbach claimed although he mentioned smudged and faint sections and parts written in a different hand. However, having Paris manuscript for comparison he succeeded in overcoming these problems. Maybe Auerbach claimed all this in order to justify his forgery – like he was writing what the Eshkol should have been, rather than what it was? Maybe Albeck was claiming that although there was a manuscript, it didn’t match and the discrepancies were unexplained? It looks like I am going to have to purchase a copy of the “Kofer HaEshkol” in order to understand what is going on. I saw reprints on sale online for USD18, so this looks like my next move. I just found (it wasn’t that difficult if I had thought to look) both Auerbach’s and Albeck’s Eshkols online. I am downloading them. What particularly interests me are the forwards. I’ll let you know what I found out. In my previous post on the subject of R. Benjamin Hirsch Auerbach (BTW, also refered to in other sources as R. Zvi Binyamin Auerbach) I mentioned in passing the controversies in which he was involved and in particular the controversy over his publishing of an edition of the Sefer HaEshkol by R. Abraham ben Isaac of Narbonne (c. 1110 – 1179). I have since done some research into the material that has been published on R. Auerbach and the Sefer HaEshkol and I felt that it would certainly make a worthy subject for a post. R. Benjamin Hirsch Auerbach was born in Neuweid on 21 June 1808 to a prominent rabbinic family. He studied under his father and then in the yeshivot of Krefeld and Worms. He then went on the University of Marburg where he studied Semitic languages and history (1831-1834). In 1835 he took the position in Darmstadt of Landesrabinner (chief rabbi) of the German state of Hesse. Here he seems to have spent much of his time and energies battling the Reform movement both on the ideological level as well as battling to retain his position against them. The Jews of Darmstadt were apparently of the Reform persuasion and gave him a hard time, whereas those in the smaller surrounding communities were Orthodox. He kept the position for 23 years and also published here a book of an educational sylabus for Jewish schools (“Lehrbuch der Israelitischen Religion,” 1839). He was involved in the publishing of the anti-reform polemic work “Torat HaKnaot” in 1844, together with other prominent Orthodox rabbis. Apart from that he established himself as a leading rabbi in Germany, among the first to preach and write in German. In 1857 he was forced to resign his position and moved to Frankfurt Am Main where he devoted himself to writing while his wife supported the family. Apparently his financial position was not good and in 1863 he was convinced to take up the position of rabbi in Halberstadt (which did not have a reform movement). In Halberstadt he developed close ties with the wealthy industrialist family Hirsch who owned a metal working business. Two of his children married Hirschs one of which was my great great grandmother Julia Auerbach who married Benjamin Hirsch. 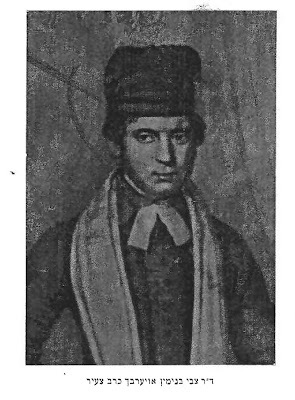 Rabbi Dr. Benjamin Hirsch Auerbach died in Halberstadt on 30th September 1872. It was also in Halberstadt that he published in 1869 (with financing from the Hirsch family) a purported manuscript of the Sefer HaEshkol, an important halakhic work written in the early 12th century by R. Abraham ben Isaac of Narbonne. The importance of this book is that it is the first work of codification of the halakha in southern France, which served as a model for all subsequent compilations. The work was accompanied by a commentary called the Nahal Eshkol written by R. Auerbach. R. Auerbach published three volumes of the work in his lifetime and claimed to be in possession of a fourth volume that he did not complete before his death in 1878. In 1909 the scholar R. Shalom Albeck raised doubts as to the authenticty of Auerbach’s manuscript and declared Auerbach’s work a fogery, basing himself on apparent unattributed quotation of sources in the text that post date the supposed date of authorship. Already in 1869 and 1880, such doubts had been raised, but the stature of R. Auerbach prevented these from having been taken seriously. Following Albeck’s challenge, four prominent German rabbis (David Zvi Hoffmann, Abraham Berliner, Jacob Schor and Hanokh Ehrentreau) wrote a booklet published in Berlin in 1910 containing a defense of Auerbach named Tzidkat HaTzaddik – “the righteousness of the saint”. Albeck did leave this response unanswered and published a further booklet named Kofer HaEshkol – “denial/rebuttal of the Eshkol” (Warsaw, 1911), in which he explained his reasons for declaring the work a forgery. Although a further defense of Auerbach was written as late as 1974 by Issachar Dov (Bernard) Bergman in an essay in the Joshua Finkel Festschrift (New York, 1974), it can be fairly said that Albeck’s arguments became accepted and the dubious nature of Auerbach’s Eshkol is now considered an established fact in academic circles as well as many rabbinic ones. Prof. Marc Shapira (see references below) brings examples of poskim who have obliviously used Auerbach’s Eshkol, including notably R. Ovadia Yosef. He also brings a couple of examples including notably the Teimani posek R. Yitzhak Ratsaby who rejects the Eshkol as a forgery and quotes and annecdotal evidence that this was also known to R. Moshe Feinstein (though he goes into detail of other sources mistakenly held to be forgeries by R. Feinstein on the basis of them containing dodgy views – an interseting subject in itself) as well as other leading rabbinic scholars. Neither R. Auerbach or his heirs ever produced the original manuscript from which he worked to transcribe his Eshkol and no reasonable explanations have ever been given for the discrepancies in the work. Whether he worked from an original manuscript, but embellished it or whether he invented it entirely remains unknown to this day. What is interesting are the places where no mention is made of the Eshkol controversy. The first and foremost of these is the Auerbach family tree (see below) which does not mention even in passing the existence of any such controversy. Seeing as the volume was published in 2002 and among its editors are academic scholars, this omission begs question. The second source where I found no mention was Wikipedia. This surprised me at first until I saw that its text is in fact copied (and credited) verbatim from the Jewish Encyclopedia which was published between 1901-1906(!) and thus pre-dated Albeck’s original aspersions. I am taking it on myself to update the Wikipedia article. In 1938 Hanoch Albeck (the son of R. Shalom Albeck) published what is accepted as being the authentic Eshkol. I have not found any material online that would suggest how he came into possession of the manuscript or the background to the publication. If any readers can fill me in on this, I would be indebted. Unrelated, a purported fourth volume of Auerbach’s Eshkol was published in 1986 by Bergman (who wrote the defense of Auerbach in 1974), presumably from Auerbach’s original manuscript. Exactly where he claims to have got this manuscript from is totally unclear (and of course he doesn’t present it either) and it doesn’t appear that this volume is taken that seriously. 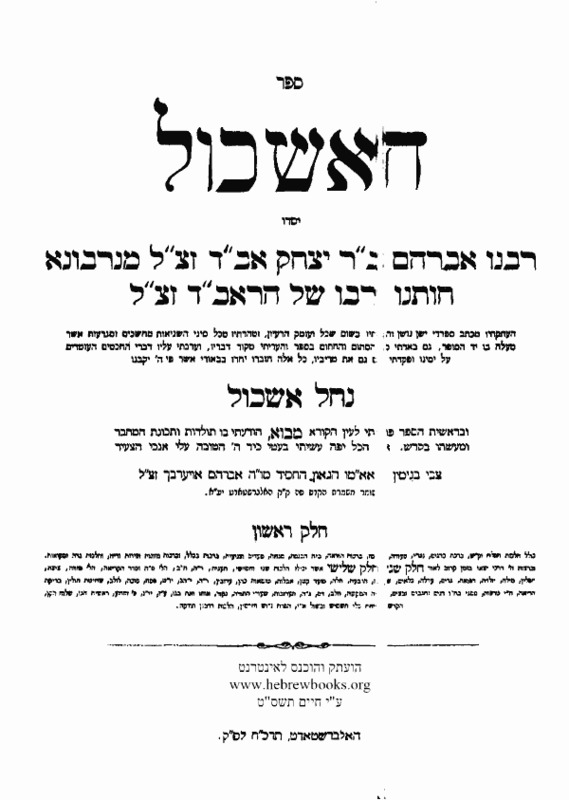 When Rabbis Hoffmann, Berliner, Schor and Ehrentreau published their Tzidkat HaTzaddik in 1910 they argued that a person of the stature of R. Benjamin Hirsch Auerbach could not possibly be held to have forged the work. They brought the Rambam to their defense who states in his commentary on Avot 1:6 that a tzaddik, even if he does something dubious, should be given benefit of doubt and it must be assumed that there is a reasonable explanation, even if it is very far-fetched. Whether you want to take Rambam here to his word or not, the question remains of why R. Auerbach would have created a forgery. It does not appear that the forgery was to forward some agenda. Neither does it appear that he needed to establish status or authority, because it would seem he already had that. My only guess could be that in his years in Frankfurt he came upon this plan to achieve fortune, even if he was not in need of fame. It may be that a manuscript did exist and he had also convinced himself that his embelishments were what the Eshkol would have said and were somehow defensible. In any case, my knowledge of this interesting chapter in our family past is far from complete and my insight is very limited. After writing about Uri Auerbach yesterday I thought it would be in form to write a few words about his great-great-grandfather Rabbi Benjamin Hirsch Auerbach (1808-1872) who is also known as the Nahal Eshkol and is described in the Jewish Encyclopedia and Wikipedia as “one of the most prominent leaders of modern Orthodox Judaism”. You can read all about him in those links. He was an interesting personage and was involved in various controversies, one of which was his publishing of a version of the Sefer HaEshkol – for which he is named. The real interesting part is that not only is he Uri Auerbach’s great-great-grandfather (Uri is 1.4.5.8.4 in the Auerbach family tree published 2002), he is also my great-great-great-grandfather – I am 1.6.2.1.2.2 for the record. Last night for the first time in my life I went to an election meeting. The meeting was for the “Habayit HaYehudi HaMafdal HaHadasha” party and the speaker was Uri Auerbach. As anyone in Israel will probably know, Uri Auerbach is a jounalist, publicist, radio presenter and childrens writer (I even wrote a blog post a while back about one of his books). He is seen by many as being a pioneer of religious people in the largely secular media and arts scene. Indeed Israeli media and arts have gone through an amazing revolution away from their socialist, internationalist and modernist roots to cultural pluralism in the last few years and Uri Auerbach certainly has been a part in this. I do feel though that he has been somewhat overtaken by the flood waters that have come in his wake but that is often the nature of being a pioneer. Getting down to politics, doubt has been expressed that the split Bayit Yehudi or Ichud Leumi will get throught the Achuz HaHasima and even get into the next Knesset. His take is that according to surveys 41% of his potential consituency of the religious public are still undecided and that the results in the general surveys are getting better. The other major political insight from surveys that he shared with us is that most of the undecided are tossing it up between Likud and Bayit Yehudi. That’s me as well. His message was double. On the one hand he stressed the sectorial importance of having “our people” in the right places to help us on a personal and community level. If you need help getting money or support for a project or institution close to the hearts of the religious community then do you go to Zvulun Orlev or to number 17 in the Likud list who has a kipa on his head whoever he may be. Fair enough, but as he admitted a large number of his potential voters don’t want to be a “sector” anymore. They are part of the larger picture of the country and want to be seen and vote as such. His other message was one of vision. We have something to offer. A different agenda. Our agenda. This is where your values and your will be heard. I am just a bit worried that they are a bit too new and naive for the political game. What do I have to show that they will actually get stuff done or make a difference? That said, I am leaning in the direction of giving them my vote.